BC Raymond Downey, in charge of Special Operations Command was a legend at 63. Affectionately referred to as “God” and “Master of Disaster,” he was one of the most experienced firefighters in the world. When “Better Angels” traveled the country, his was one of the most visited portraits on the wall because he was known by firefighters across the country. Downey was a founding member of the FEMA Urban Search & Rescue Team network, and the FEMA Operations Chief at the Oklahoma City bombing site, among others. 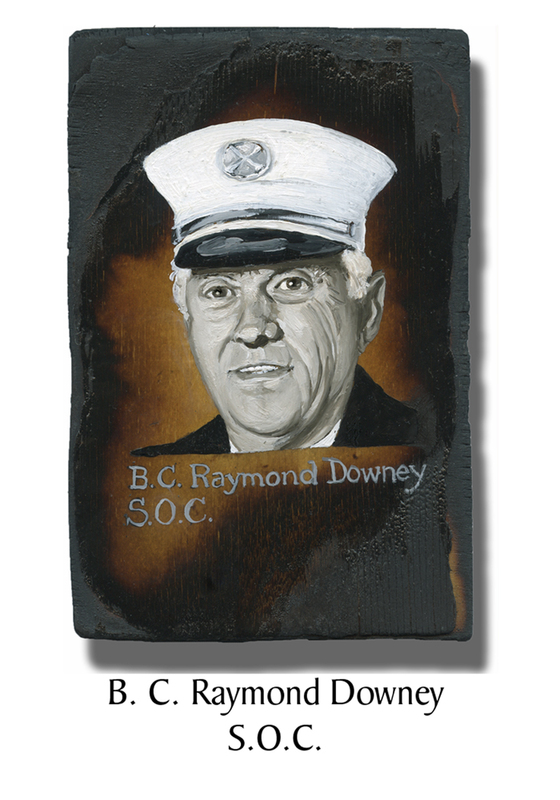 Downey had recently been honored with the Crystal Apple Award by Mayor Giuliani in July, 2001. After his death, he received the Department of the Navy Distinguished Public Service Award, the Congressional Fire Services Institute Mason Langford Award, and the Medal of Courage Award upon induction into the National Wrestling Hall of Fame. He was posthumously promoted to Deputy Chief. It is believed that Downey and BC Stack were in West Street, both helping a civilian with a torn Achilles tendon when the North Tower came down on them. This entry was posted in Better Angels Stories and tagged 343, 9/11, better angels, Dawn Siebel, FDNY, firefighter, firefighters, firefighters of 9/11, LODD, Manhattan, memorial, NFFF, paintings, portraits, Raymond Downey, S.O.C., Special Operations Command, World Trade Center, WTC. Bookmark the permalink.